The ruling EPRDF party is poised to extend its 24-year rule in an election many have dismissed as a farce. Simona Foltyn reports from Addis Ababa. 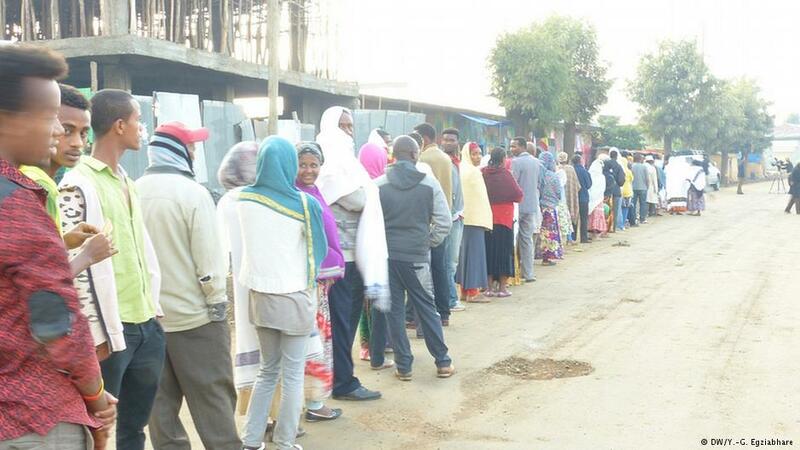 At 6:30 am on Sunday morning, with polls open for only half an hour, lines had already formed outside polling stations in Addis Ababa. Over 35 million, or 80% of the eligible electorate, registered to vote in an election many have dismissed as a formality to extend the 24-year reign of the ruling EPRDF, which currently controls all but one spot in Ethiopia's 547-seat national parliament. Ten years ago, the opposition won all 23 seats in Addis Ababa. This year, the mood in the capital appeared markedly different. Stability and development, as opposed to change, seemed to be the priority for many voters in Africa's second most populous nation. Recalling his time as a forced conscript under the violent Derg regime deposed in 1991 by the then rebel movement turned dominant ruling party, Yohannes Barso appreciates the benefits he has been receiving from the government, but says he values peace above all. "Even if the government changes, I want it to be a peaceful change, without any violence," the 43-year-old father of four told DW after he cast his vote for the EPRDF. But the government is unlikely to change. Although 58 parties contested the ballot, only two – the centre left coalition MEDREK and the recently founded Blue Party - are considered actual even if minor competition to the ruling party. Most parties are unknown to the electorate or believed to be allied with the ruling EPRDF. Opposition leaders allege that the large number of parties served to dilute the vote and create a false perception of a competitive environment. Opposition supporters appeared to be few and far between amid the dozen voters DW interviewed throughout the capital. Those who admitted having voted for the opposition were reluctant to reveal their names for fear of retribution. "I'm going to vote for the Blue Party, although I don't know their detailed strategy, I hope they will give motivation to the people of Ethiopia," a 29-year-old electrical engineer told DW at a polling station near the French embassy, an area where opposition supporters took to the street to protest the controversial results of the 2005 vote. "Though I know that the government will have the majority, there will at least be some debate in the parliament," he added. Other voters said the opposition is too weak and fragmented, and has failed to present a convincing alternative to the EPRDF's growth and transformation plan, which has brought about double-digit economic growth over the past five years. "The opposition parties, they always criticize the EPRDF policy, but they don't have their own policy," said Tedros Haileselassie, a 24-year-old health professional and EPRDF voter. An election observer for MEDREK, the leading opposition coalition, offered his explanation for what appears to be a scant turnout for the opposition. "When you interview people, even though they voted for other parties, they will say they voted for EPRDF because of fear," said Tasew Kidane. In the run-up to the election, both MEDREK and the Blue Party accused the government of blocking their campaigns and candidate registration through administrative hurdles, which they claim has impeded their ability to court voters. Few supporters turned out for opposition rallies across the capital in the days leading up to the vote. The opposition also complained of irregularities on election day. Yonatan Tesfaye, the Blue Party's spokesman, said that the party's observers were denied access to voting stations. "Since the morning, we have been hearing reports from all over the country that observers cannot attend morning activities like checking the ballot box [..]. In some areas observers are under house arrest, they cannot go out of the house to observe the vote," Tesfaye told DW over the phone. The Blue Party and MEDREK observers further claimed that representatives of the ruling party intimidated voters. The voter education provided in the polling station was misleading, inducing voters to tick the EPRDF box, party representatives said. The European Union, which committed 745 million Euros in development assistance to Ethiopia for 2014-2020, did not deploy an observation mission this year. In its 2010 election observation report, the EU concluded that the vote fell short of international standards, but the findings were rejected by the government, which accused the EU of political bias and barred the report's presentation in Ethiopia. The government rejects the idea that the absence of EU observers could call into question the legitimacy of the vote. "Our election is observable to anyone who is interested. The African Union has sent observers, in this regard the absence of the EU doesn't affect the process," Desta Tesfaw, the head of the EPRDF's public and foreign relations department told DW on Thursday. Election results are due to be released on June 20. With the EPRDF's landslide victory almost certain, there is little left for voters but to hope for a better next term. "I want the government to improve the quality of education and to introduce better governance," said Hagos Gebreegizeber, a professional runner. The 24-year-old then proceeded to vote for the EPRDF. "They are building stadiums and have created a lot of opportunities for young athletes like me to compete abroad."